Here is an awesome uncut Sample Sheet Baseball Cards obtained from the collection of a former Topps Executive that just closed on eBay for $10,000.00. 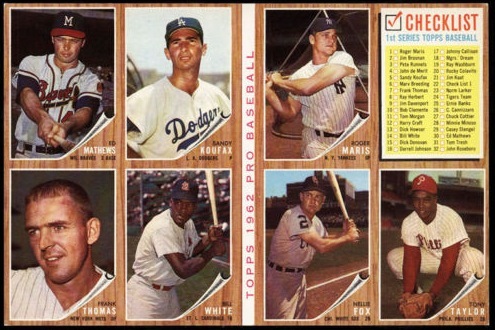 This incredible eight-card blank-backed sample sheet features the 1962 Topps baseball cards of Eddie Mathews, Sandy Koufax, Roger Maris, Frank Thomas, Bill White, Nellie Fox, and Tony Taylor along with a 1st Series Checklist. The condition appears to be excellent as seller states there is only minor wear on the four corners as well as a slight touch of wear on the top border of Maris and the checklist. The rest of the interior cards including Sandy Koufax are in perfect condition and would grade Mint or Gem Mint if professionally cut from the sheet. Considering the premium placed on Sandy Koufax as well that of blank backed cards, the corresponding value of this item makes it one of the premier collectibles for this legendary Hall of Fame southpaw. Total size of this uncut sheet of sample baseball cards is 7 inches by 10 1/2 inches. Vintage uncut baseball cards sheets are going up in value as they become harder to find, take a look at some more uncut baseball cards sheets available on eBay.